In the beginning, there is only one woman. But she is not alone. Sarah Roy’s powerful one-woman black comedy takes us through the childhood, adolescence and adulthood of the well-read social misfit Catherine who, traumatised by an abusive father, isolation at school and marital problems, seeks refuge under her loyal friend Anita’s companionship and care. The only problem is that Anita is invisible. As Catherine treads the tricky path between thriving after victimisation and recognising her mysterious friend as an illusion from psychosis, Catherine and Anita, written and directed by Derek Ahonen, brings to light the heart-breaking message of how social misunderstanding and negligence, instead of the disorder itself, entrap an individual psychologically. The success of this slick and quick play—lasting for well under an hour—is hugely attributed to Roy’s soul-gripping performance. Wearing the same simple blue dress throughout and with a few hairstyle tweaks in between scenes, Roy not only shows the numerous sides of Catherine as she grows from the fidgety seven-year-old to the feisty yet trouble-torn woman; she convincingly conjures up scenes of intense interactions with both imaginary and real characters with her twisted facial expressions, nervous stares, stuttering and gestures that capture a lonesome woman yearning for love and attention. We chuckle at her mad, crazy and almost naïve resistance against the world’s bullying, and yet sourness and pity well out from within us. What is supposedly a rather empty stage conversely dazzles us with meticulous lighting designs by Holly Ellis. The sickly purple lighting expands the space that paradoxically closes in on the scared Catherine who blames her imaginary friend for the murder of her father; the blazing red hue parallels her explosive defence of her sanity. Together with Dave Walker’s selection of ironically casual songs about love and meticulous treatment in sound effects, such as muffling the background noise of school children playing to crank up Catherine’s internal silence, as well as Nina Harding’s seamless scene transition and timing, the stage confronts us with discomfort as we sit still to scrutinise Catherine’s contorted world. The play may be short but the disturbing effect haunts us through the night. Ahonen dissects Catherine’s narrative into seven scenes that jump back and forth in time, mirroring the character’s confusion and distorted senses as well as heightening the tension of her capricious mental state. The monologues are witty with humour, succinct in controlling the pace and yet elaborate enough to shape a character with whom we come to sympathise. The conclusion, surprisingly, remains murky as Catherine seems to both relapse into blaming Anita for another ‘mischief’ and cut ties with her friend once and for all. So in the end, is there only one woman on stage or two? You must come see it for yourself. Watch the show that weaves together murderous impulses and wild imaginations with pain and fragility laid bare—a performance that will surely give you, if not answers, an adrenaline rush, a memorable theatrical experience and a heart-wrenching social message to bring home. Zabrina Lo is a postgraduate from Hong Kong studying English Literature at University College London. 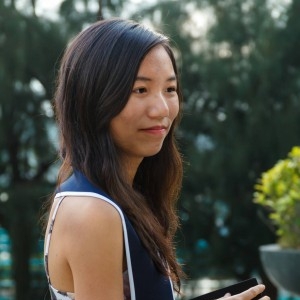 She co-founded Edge, the creative journal of the English Department at Hong Kong Baptist University that has been collecting and promoting English prose and poetry writing in her home city since 2015. When she is not in classrooms, theatres or libraries, she is a flâneuse documenting stories in London or capturing the wildlife with her camera.